I am a rising senior from Northern California. I enjoy going to the beach and hiking, and I have a black belt in karate. 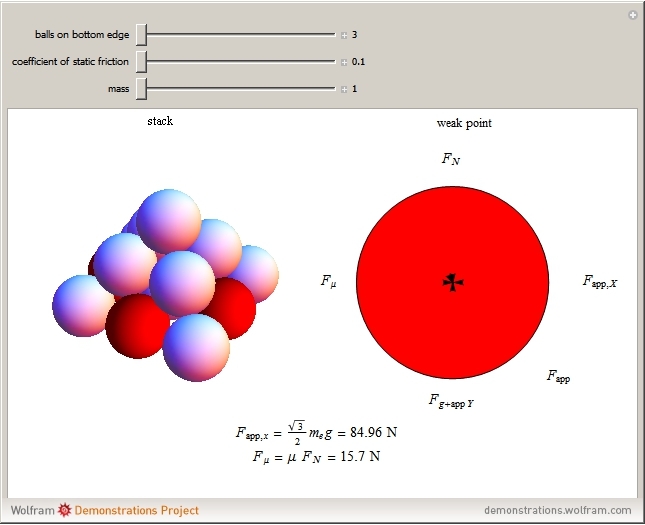 I love math and physics and am excited to learn about coding in Mathematica. A square base pyramid built of identical spheres of a given size will structurally fail with certain coefficients of static friction for the stacking surface. As the number and mass of the balls increase, the mass of the pyramid applies an increasing force (Fapp) to each ball on the bottom layer. This force will eventually exceed the capacity of the frictional force, which is limited by the coefficient of static friction between the floor and the balls. The first points of failure in a pyramid are the balls along the perimeter of the base excluding the corners; these balls are highlighted and change color when the component of Fapp that is parallel to the floor exceeds the capacity of the frictional force.